2. Watching the pros on a special 2-hour DVD produced by Accu-Stats and myself. Check out sample pages AND sample videos!! Andy Segal's Cue Magic. Inside the World of Modern Trick Shots. Now Available! 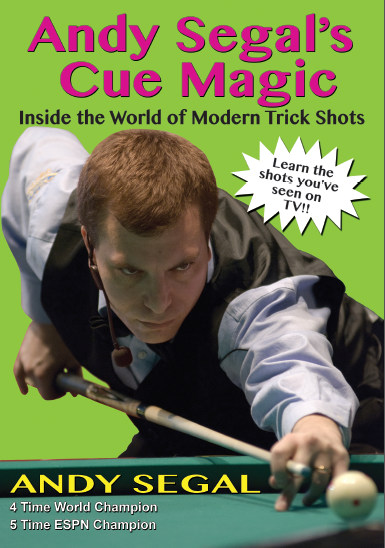 Andy Segal’ Cue Magic opens with a thorough description on technique, including top notch on instruction on the jump shots, that will be of value to the aspiring trick shot artist, and to any player. Segal then describes how to play 121 of his modern day trick shots — the ones he has been using to win major competitions and to wow audiences at his shows. Every shot includes a perfect, to scale diagram to assist the student, and/or a photo of the shot. The shots include Pinball, Drop Kick, Slalom, Field Goal, Zig Zag, Prison Jump, and the Viagra Shot, just to name a very few of his creations. 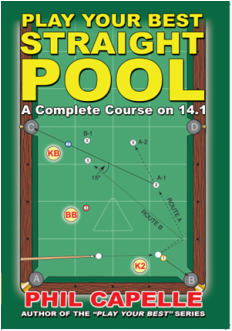 Colorful drawings appear throughout the book, which also includes a dozen of the author’s favorite stories about his life in pool. Several indexes increase the usefulness of the book by directing the reader to various categories of shots. Only $16.95 (retail $19.95) - click here to Order today! - 120 lessons on the mental side of pool. - 80 checklists to evaluate your game. - 295 of Capelle's Law for Pool. - Over 500 great quotes applied to pool. Find out about this awesome book and DVD combination!